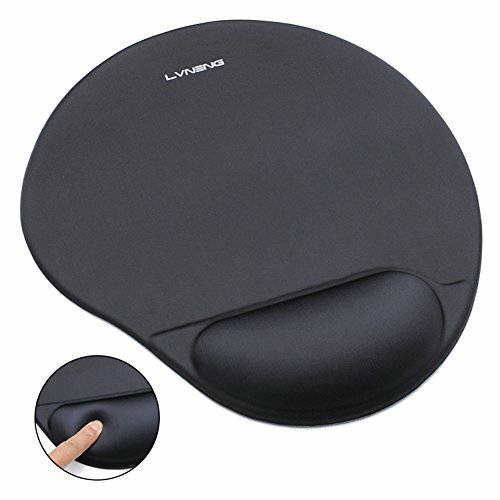 LVNENG mouse pad with gel wrist rest's unique design and use of quality materials provide ergonomic support for your wrist. The cushion creates a Comfort Zone that contours to your wrist's natural curves and movements, relieving hand and wrist stress. At LVNENG, we believe in our products. That is why we offer this mouse pad return & exchange within 90 days after purchase, and warranty period of 365 days. Non-skid PU backing----The polished rubber backing enhances the grip over the desk surface. It keeps the mouse pad firmly in place even during vigorous mouse swiping. Stylish shape design and extra-large size----The mouse pad has the footprint of 10.5 In x 9.5 In, with thickness of 0.15 (mouse pad) to 0.85 In (wrist rest). The spacious mat area provides sufficient flexibility for mouse movement in work or play. The reinforced edge prevents the mat from altering its shape and spoilage during use, ensuring its long usage life. RoHS compliant materials and excellent after-sale service----We use only non-hazardous materials that are in compliance with RoHS regulation in building this product, commit to user safety and zero-hazard release to the environment. This product is eligible for return and exchange within 90 days after purchase, and warranty period of 365 days. If you have any questions about this product by Lvneng, contact us by completing and submitting the form below. If you are looking for a specif part number, please include it with your message.